So, I thought it might be nice if I popped in here and wrote a real live post for a change. The nice folks who allow me to repost their blogs are a godsend for folks like me who really aren’t all that great at keeping up a blog. However, it isn’t fair to leave people hanging as to what is going on with me and my writing. The biggie is that book three is getting near completion in terms of its first draft. I finished up the last big fight scene about a week ago, and I’m now finishing up the last story-line which will funnel into the dramatic (I hope!) ending. As usual, I have determined that I have written way too much for one book, so I will be stripping out one (maybe two) story-lines and shifting them off to a fourth volume. Yes, I have determined that there is enough material for a fourth book. However, rest assured that the ordeal with the Dragon Queen will be concluded in book three. With the conclusion of the first draft imminent, I have some additional items I need to seriously start futzing with. One, and this is a bit embarrassing, I still have not settled on a title. Obviously, it will follow the pattern of the first two books and be “Exile’s”, well, something. I have a page of possible words to use, but none of them jump out as “the” word to use. That brings me to my next item. I’m looking at turning my author page on Facebook into a group. It is my understanding that groups can do things like run polls. I thought it might be fun to set up a poll with possible titles and see what you guys think. Along with that, I’m not completely settled on who to feature on the cover. I know the dominant color will be red, and I know that one of the characters will be Foxfire. I’m leaning toward Kela as the second character, but I may run a poll to see if a different character might be more popular. The final piece of work which must be completed before the book actually shows up in the store is the back copy. This will also serve as the copy for Amazon to lure in potential readers. Since my first book, I have learned that I’m doing copy writing all wrong. I’ve taken a few online courses and read a book now on how to do it, so I’m hoping I’ll do a better job this time around. Once I get the third book out I will go back and update the copy for the first two books, but that is something for later. Right now my focus must remain on completing volume three before all of us die of old age. I hope this information proves to be good news for everyone out there. Completing this update will allow me to check off one of the to-do items on my list as book three nears completion. I appreciate everyone’s patience, and am crossing my fingers that the wait will prove worthwhile. Glad to hear that the 3rd book is going so well. I can happily state that this post has made my day, maybe my month. I was wondering how you feel about this draft, will you need four more rewrites or do you think another pass will do? Now I will throw you some random word combinations that might fit for the title from the little I know(maybe the ideas will be so bad they will send you in the right direction) Exiles Fight, Exiles Quest, Exiles War, Exiles Chance, Exiles Persecution, Exiles Chase and Exiles Banishment(that might be better for a prequel). Hey! Thanks for popping in. So, my general feeling about this manuscript is that I tried to cram in way more than I should have. I don’t know about you, but as much as I enjoy things like ‘Game of Thrones’ and all things Steven Erikson, the length of those works are a bit much. So, my first task will be to rip out at least one, maybe two story lines. They will become more important story arcs for volume four. Then, I will take the story lines I have left and distribute them into alternating scenes. The reason I have to do this is I tend to write one story line to completion and then work on another. I break them into smaller bits and distribute them in the hopes that everything works out chronologically. During this process I may add or subtract a few scenes to make them work as a cohesive unit with the rest of the story (or if I find I’ve neglected a character too much). This has good and bad points about it, but one of the good things is that it makes it pretty easy to remove entire story lines without disrupting the entire story. I then send everything to my editor. She’s fast. Almost superhuman fast. That translates to me getting 2-3 chapters a day back from her. I make changes to them as I get them. Within a month, I should have done the revisions she suggests. I will then send the piece to my beta readers. Last time they provided me with enough input that I added some additional description and weeded out an overused word. That took a day to make those changes. I then have to do the ebook formatting and the layout for the print book. I’m assuming that somewhere during the period where my editor has my manuscript I’m working on the cover, so it’s already done by the time I do the formatting. That is a long-winded way of saying I do still have some work ahead of me. I can’t imagine I’ll ever get to the point where the first draft just requires a bit of light dusting. I am much too in love with passive voice, and I overuse ‘that’ (among other things). I’ve found if I worry too much about those things during the initial draft, I don’t make any progress. It’s easier to go back and fix things than it is to get it perfect the first time. Sounds great! 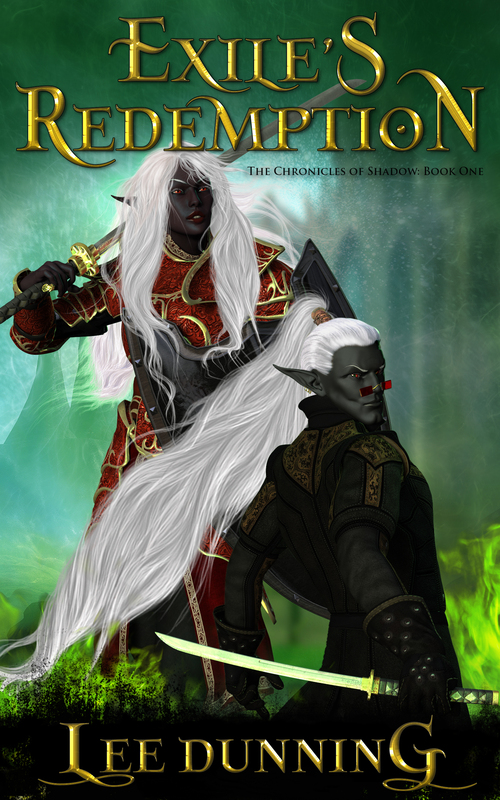 Chronicles of Shadow is one of my favorite book series. Thank you so much, arkuestner! That there will be a fourth book in the series should come as a pleasant surprise to you then. I am excited to learn about the 3rd and 4th book. I KNEW there would Have to be one because of the length of e-books and the veritable mountain of story left to learn. You’re a fabulous writer and I enjoy reading your stories immensely! Wow, thanks so much for the kind words. Hopefully, I will not leave too many old story lines unfinished with this next book. I know how frustrating it is to keep getting dragged along with no resolution.